Pat Milton celebrates 65 years! 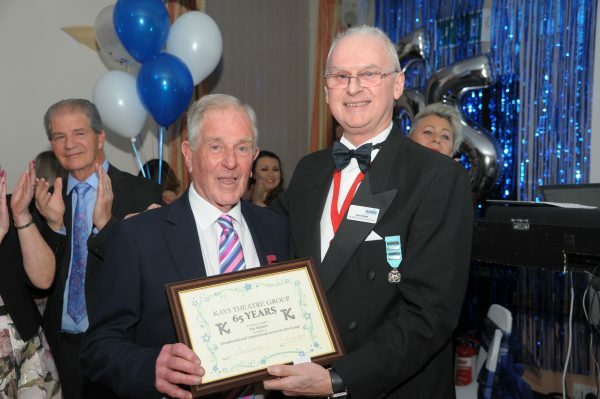 100 members of Kays Theatre Group recently celebrated their 65th anniversary with an award ceremony and party held at Perdiswell Young People’s Leisure Club. Pat Milton, the founder member received his 65-year award from the National Operatic and Dramatic Association’s (NODA) Regional Representative, Bruce Wyatt. Pat, who joined Kays, the mail order company in the early 1950’s formed the group as an offshoot of Kay & Company Limited’s Sports & Social Club. They quickly settled on producing an annual pantomime and they’ve not looked back since, regularly being nominated for Best Pantomime in the region. Already in the planning stages is the next Kays panto, Robinson Crusoe and the Pirates, to be staged at The Swan Theatre from 30 January to 9 February 2020, written by Alan Frayn and directed by KTG member, Sue Cassidy. Andrew Easton is Musical Director and the cast will be joined, once again, by the award-winning dancers from Harlequin Stage School, choreographed by Miss Paula Dymock. Get togethers will take place on 16 and 23 May at Perdiswell Young People’s Leisure Club with auditions to be held on Sunday 2 June.